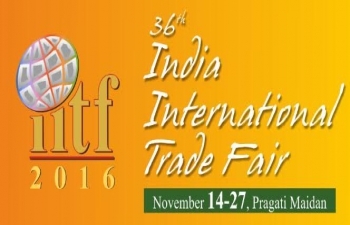 The India Trade Promotion Organisation (ITPO) is organizing the 36th edition of its annual mega event "lndia International Trade Fair" (llTF) in Pragati Maidan, New Delhi from November 14-27, 2016. The llTF has showcased India's industrial strengths and manufacturing capabilities. With the "Make in India" initiative of the Hon'ble Prime Minister, the llTF is a platform for projecting the country as a destination for trade and investment with investment friendly environment and is a high potential market of over one billion consumers. 2. llTF is the largest integrated trade fair with B2B and B2C components and has emerged as the largest trade fair in the Indian sub-continent. lt is an effective showcase displaying achievements and technological advancements of India in a wide range of products and services. 3. The first 5 days (November 14-18, 2016) of the Fair are exclusively earmarked for business visitors. The Fair is open to general public from November 19-27, 2016. 4. There is a large presence of Indian and overseas companies displaying their products and services in the event. The theme of llTF-2016 ‘DIGITAL INDIA', an initiative of the Government of India with the vision to transform India into a digital empowered society and knowledge economy. The programme is focusing on improving the enabling infrastructure as well as increasing internet connectivity. 5. The last edition of the fair witnessed a huge turnover of business visitors, both domestic and international. llTF was visited by 52 foreign trade delegations from over 45 countries across the globe. The visitor profile covers leaders of trade and industry, foreign dignitaries, decision makers, policy makers and opinion makers. 6. An International Business Lounge will be set up at Gate No. 1 of Pragati Maidan to facilitate the visit of international business visitors. South Sudanese Chambers of Commerce and allied agencies are requested that the information about the fair may be disseminated among the trade and industry in South Sudan and to forward the names of business delegations / persons interested in visiting the Fair. This will enable ITPO to plan their visit in order to ensure optimum results during their visit. 7. More details on the event are available at website www.iitf.in.